"Around 1910, Pop Wonder's circus performs throughout the Middle West. Its major asset is Jumbo, a versatile performing elephant, and its major liability is Pop's uncanny ability to lose the week's receipts at local crap games. One day Pop's daughter, Kitty, hires Sam Rawlins, a jack-of-all-circus-trades, who proves to be both an excellent performer and an able tent hand. Unknown to all, however, is the fact that Sam is the son of John Noble, a circus entrepreneur who plans to get control of the Wonder Circus--and Jumbo--by buying up all of Pop's I.O.U.'s. Despite his growing love for Kitty, Sam reluctantly carries out his father's wishes and acquires the circus from Pop. Refusing to admit defeat, Pop, Kitty, and Lulu, Pop's fiancée of 14 years, become a touring carnival. They are eventually joined by Sam, who has broken with his father and persuades them that he is interested only in getting the Wonder Circus back in business. As proof of his sincerity, he has brought with him their beloved Jumbo. By pooling their talents and efforts, the four performers make the Wonder Circus 'the biggest little show in the Middle West.' "
Kitty: Jumbo is a star not a laborer. "This was Doris Day's last appearance in a full-on musical - and one of the last of the lavishly-budgeted MGM musicals as well. Despite Day being ranked the #1 box office star at the time of its release, it was widely considered a box office failure." "This movie was based on Billy Rose's 1934 musical extravaganza and he insisted that the full title be used on the movie. The 1935 musical play of Billy Rose's 'Jumbo', on which this film was based, was the final stage presentation at New York City's venerable Hippodrome Theatre, which was torn down to make room for a parking lot. The show opened on November 16, 1935 and ran for 233 performances. 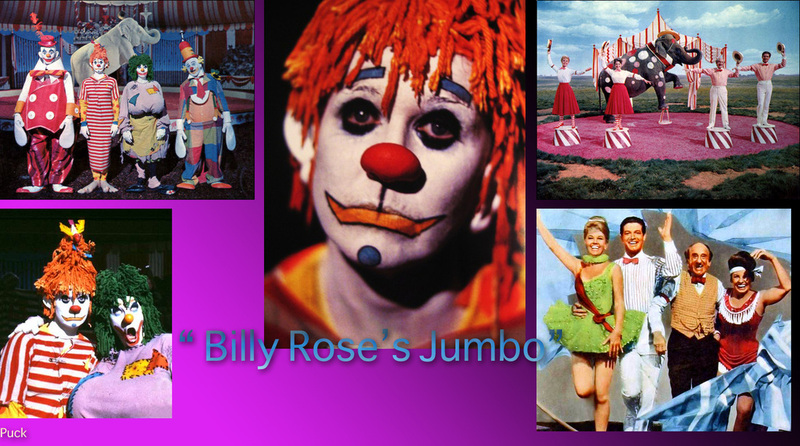 Historical records show that many of the character names and songs of Billy Rose's "Jumbo" in the 1935 stage production were entirely different. Jimmy Durante appeared in the original New York stage production, but not as the owner of the circus. He is listed as 'Claudius B. Bowers', a character name not in the film." Steve Lawrence mentions Doris Day and her film: "Jumbo". "This musical marked the end of Busby Berkeley's movie career." "Throughout Jumbo's original run, Rose was besieged with claims that the plot had been stolen from a variety of sources, though nobody could make enough of a case to get even a token settlement out of him. When he was negotiating the sale of film rights to MGM, however, Hecht, who was angry at Rose for re-writing his script at the last minute, told studio executives that he had, indeed, borrowed the plot from another play. As a result, MGM dropped its offer from $200,000 to $50,000. Desperate to break even on the show, Rose had to accept. Then the studio sat on the property for almost three decades."